Beginning in March, Delta Airlines will be asking passengers flying with service animals in the cabin to sign a statement that their animal is healthy and well-behaved before they can board a flight. The policy change, announced last week, comes as businesses and employees are expressing growing frustrations about the rise of people claiming their pets are service animals or emotional support animals. Airlines have seen a huge increase in service animals boarding the cabins in recent years, with Delta reporting that complaints about animals biting, urinating, or defecating on planes have nearly doubled since 2016. In June, one Delta passenger was hospitalized after another passenger’s support dog reportedly bit him in the face. By requiring people with support animals to sign a statement asserting that their animal is well-behaved, Delta is attempting to find a balance between passenger safety and supporting “those customers with a legitimate need for these animals,” as Delta told the Associated Press. But lost in the anger over fake service animals on airplane cabins is the lack of safe options available for people who need to transport larger, non-service animal pets across the country. Airlines such as Delta say that they welcome regular pets in the cabin as well, provided customers pay an additional fee, but the pets must be small enough to fit in a kennel underneath an airplane seat. That leaves larger pets, such as mid-size dogs, with few choices other than the dreaded cargo hold of the airplane. Airlines are required to report all animal injuries and deaths that occurred on their trips regularly to the Department of Transportation. On August 25, an Aussie Shepherd puppy was shipped via Delta airlines from Kansas City, Missouri to Rhode Island, with a layover in Detroit. But upon arrival in Detroit, “the puppy was unloaded and noticed unresponsive.” The puppy was later pronounced dead “from acute myocardial necrosis,” a condition caused by oxygen deprivation. “No corrective action taken,” Delta’s report into the puppy’s death concluded. It does not explain why no corrective action was deemed necessary. Earlier that same month, a kitten getting shipped from Indiana to Montana with a layover was found to be unresponsive in the animal holding area after its first flight. In that case, Delta reported to the DOT that “no corrective action” was necessary, claiming that the kitten had a pre-existing medical condition. 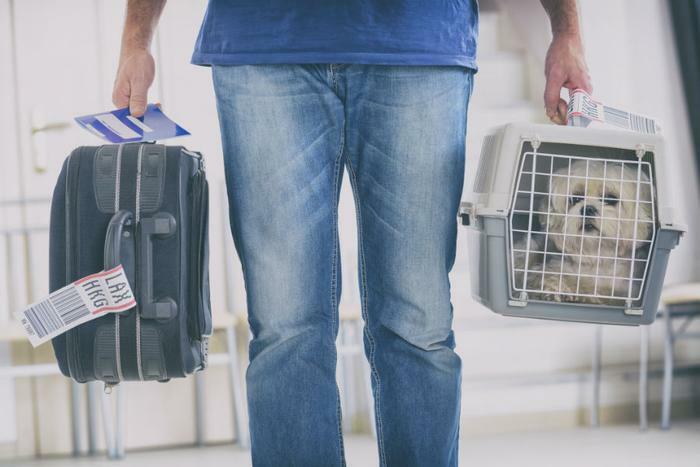 Those in the airline industry typically say that the animal deaths account for a small number of pets they safely transport, but the public reports may not be telling the full story. (The owner had said that the dog arrived at his destination in poor health after enduring an unanticipated 20-hour layover). Airlines have responded to reports about pet deaths by encouraging pet owners to pay extra to bring their pets onto the cabin and cutting back on shipping animals as baggage. Two years ago, Delta announced that it was no longer accepting pets as checked baggage, framing the policy change as a measure that would make pet travel safer. Bringing the pet aboard the cabin costs just $125. “Many of us at Delta are pet lovers and we know that they are important members of the family,” Bill Lentsch, the airline’s senior vice president in customer service and cargo operations, announced at the time. But in the fine print, Delta explains that pets flying in the cabin must be small enough to comfortably fit in a kennel underneath the airplane seat. Otherwise, the animal is shipped via Delta Cargo. The airline portrays its switch from checked baggage to Delta Cargo for animals as one ensuring “a high-quality, consistent service for pets,” with temperature-controlled holding areas and professional kenneling services to monitor the animals overnight if necessary. Yet that apparent switch from checked baggage to cargo hasn’t stopped animals from dying. Delta reported five deaths to the Department of Transportation since that policy change went into effect, including the two that occurred this past August. In all of the cases, the animals appear to have been flying underneath the plane in the cargo hold, as the reports describe airline staff loading and unloading animals that they later found to be unresponsive. Delta declined to answer specific questions about its handling of pet shipments, instead directing ConsumerAffairs to a press release announcing the switch from checked baggage to cargo.